The Electromix System includes a low power pump with hydraulically driven piston and the Electromix agitator. This system evacuates dairy manure that has been fully agitated and homogenized through underground line from tied stall or from free stall barns up to the main storage. The manure may contain bedding such as straw or sawdust of a consistency not exceeding 1½". The Electromix pump can be either wall mounted or floor mounted. Most of the time, the Electromix system requires a liquid return line from the main storage back to the reception pit in order to precondition the manure before transfer. The Futuro is a low power pump with hydraulically driven piston. The large flapper valves inside the evacuation chamber are pressure actuated to evacuate dairy manure through underground line. 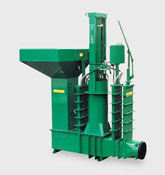 The flapper valves design and the Futuro heavy-duty manufacturing allow handling manure containing limited amount of bedding such as sand, sawdust, wood shavings and chopped straw. 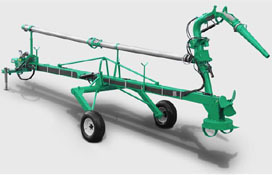 The Futuro pump can be equipped with either a hopper inlet to collect manure from a cross gutter cleaner or from a skid-steer loader or it can be equipped with a suction pipe to be gravity fed. The Magnum is a low power pump that transfers efficiently thick manure from tied stall barn or from free stall barn up to your main storage through underground line. Different configurations of hopper inlet are offered to suit 1 or 2 barn cleaner installations and alley scraped by a skid-steer loader. The Magnum comes with different discharge choices depending on the installation and the type of bedding. 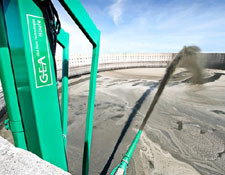 The Vertical Agi-Pompe and Super Pump are two distinctive product offering a high level of performance in agitating and transferring manure from concrete pits. Both of them are available in six different configurations. They are offered in five different lengths : 32, 42, 52, 62 and 72 feet (10, 13, 16, 19 and 22 m) and come with a wide selection of well-built and robust trailers. 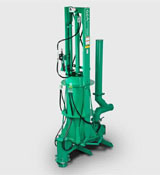 The Lagoon Agi-Pompe offered by GEA will provide an excellent stability in order to work safely. The nozzle and the directional valve are located above the liquid level allowing easy maintenance when required. 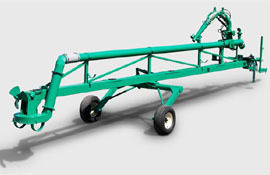 The Lagoon Agi-Pompe CA8 is available in three different lengths: 32, 42 and 52 feet and its 8" discharge ensure a fast manure loading. 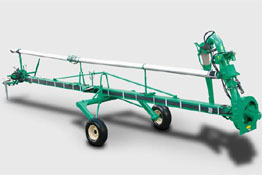 The Lagoon Super Pump is offered with 6" or 8" discharge and a wide range of well-built and robust trailers. They are specially designed to facilitate the travel, approach, agitation and transfer of manure lagoons. These heavy-duty pumps will rapidly homogenize liquid manure in lagoons. 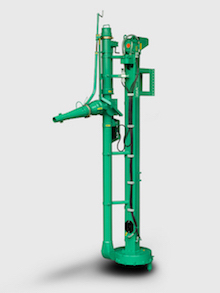 The Super Pump is built with the same high quality construction as the Agi-Pompe and is the right choice to homogenize and transfer dairy liquid manure and hog slurry that may contain limited chopped bedding and minimal water with bottom sediments. The Super Pump is available in two versions : 6" (152 mm) – 540 and 1000 HP and 8" (200 mm) – 1000 HP only. Rotating valve that can be operated while the pump is at low RPM with a visual indicator rod allowing you to know if the pump is working in agitation or loading mode. Easy access for maintenance of the lower driveline joint. 20" (508 mm) impeller featuring self-cleaning blades, reversible knives at the intake and abrasive resistant steel housing/bottom plate. Hydraulic controls or optional speed reducer to easily change the direction of the nozzle. Remote grease line kit. To lubricate the bearing housing without removing the pump. Impeller housing made of Abrasion Resistant steel. The HE Series 17" (432 mm) impeller for the 20" (508 mm) housing is standard only for qualified Vertical Super Pump. The most powerful of all 3" pumps, it will respond to high head pressures while remaining economical. The 3" High Pressure Pump is direct drive with jaw coupling or can also be available belt driven for regions on 50 Hz power. Available motors: 5, 7.5 or 10 HP. Not available for 50 Hz electric motor. 3" (75 mm) pipe discharge. Drive shaft with an anti-vibration bearing. Controls are easily accessed from the top of the pump. Stainless steel threaded shaft to prevent rust and corrosion. Double bearing housing protected by our 3 seal system. Optional 285° rotating agitation nozzle with up and down articulation. Stands out from the other pumps because of its ability to provide both high performance pumping and high efficiency agitation. Available motors: 15, 20, 25, 30, 40 or 50 HP (11, 15, 18.5, 22, 30 or 37 kW). The efficient design of the directional valve maximizes the pumping capacity. 16" (406 mm), 18" (457 mm), 20" (508 mm) or 24" (610 mm) propeller, depending on manure type. Propeller knifes to cut fibrous material. Conical receptacles offer a strong and stable anchoring point for the pump. Optional 4" (100 mm) submerged discharge for an underground transfer line. Optional 215° rotating agitation nozzle with up and down articulation.